For the past few days, the kitchen faucet has been making an unusual sound. Tonight I finally found a few minutes to take it apart and investigate. In the fifteen minutes that it took me to fix the faucet, without any effort at all, four different images kept popping into my head. First was Cliff Huxtable. Anyone who has watched the Cosby Show knows that Cliff thought he was quite the family handyman -- although the final results of his work often showed otherwise. I couldn't help but recall the Season 7 episode, Theo and the Kids, Part 1, where Cliff attempts to fix the kitchen sink with the help of Olivia. Showing the age of this show, this scene includes Olivia delivering the line "You've got the right one, baby" to a huge roar of laughter and applause from the studio audience. Of course, Mouth came to mind as well. In the opening scene of The Goonies, his car chase watching is interrupted when he is sprayed in the face as his father fixes their kitchen sink. These few seconds of this classic movie have always brought two questions to my mind. #1 -- Where is the water coming from? It appears to be shooting from the drain and not from any typical water source. And #2 -- As Mouth is being sprayed in the face, why doesn't he move out of the way? Instead, he keeps his face in the direct line of fire until he father is able to contain the spray. And how could I not think of God's gift to movies, otherwise known as the Karate Kid? 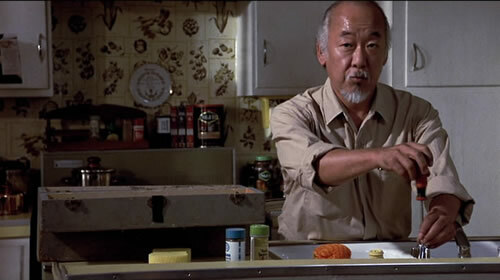 With faucet fixing at hand, I could hear Mr. Miyagi plain as day as he enters the LaRusso's apartment: "Fix faucet?" 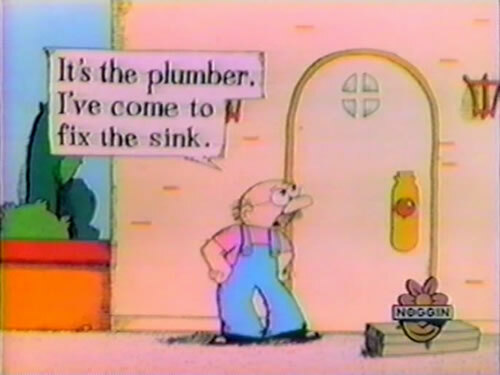 "It's the plumber. I've come to fix the sink." This is how my mind works. Sad. I know. I love it! What an awesome idea for a post. 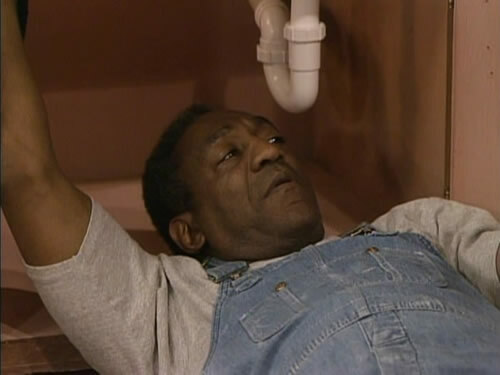 I have been working my way through the Cosby Show series this summer and the theme of him being a lousy handyman is so funny.